"The town that I knew then." 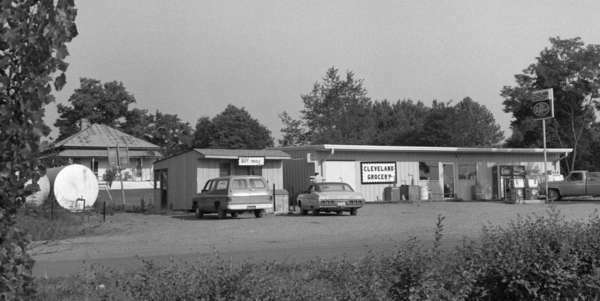 This photo of Cleveland was copied from the original in the possesion of one of Cleveland's oldest residents. Daddy had this copy in his desk and was amazed when I scanned it and displayed an enlarged version on my laptop. He identified some of the people but I didn't take adequate notes. However, I do remember that he said that the third building from the left, the one with the double rectangle facade, was moved across the street to the east side and eventually was Mr. Fazier's store that Daddy bought in the 1950s. It is visible in its new location in some of the other photos. 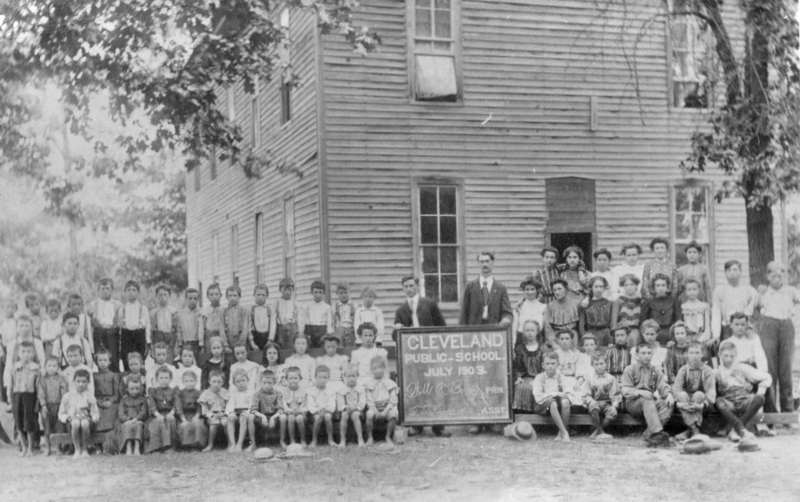 This is the Cleveland school in 1903. 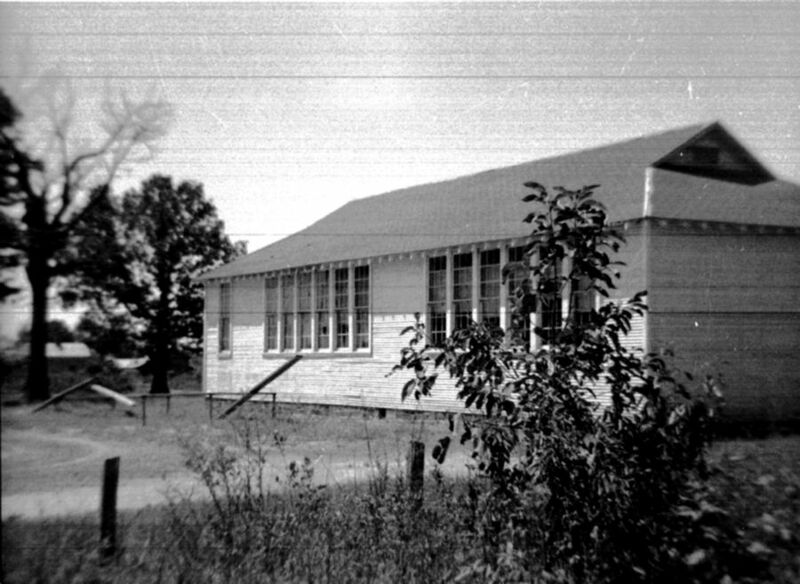 This is the Cleveland school house in 1940. It was in the background of a photo from Henry Frazier's home. I'm pretty sure that tree was still there when I started school in 1947. The building shown here had burned before that time. Tommy Massey and I played with the melted window glass that was still lying around the old porch foundation. It was our "gold" treasure. 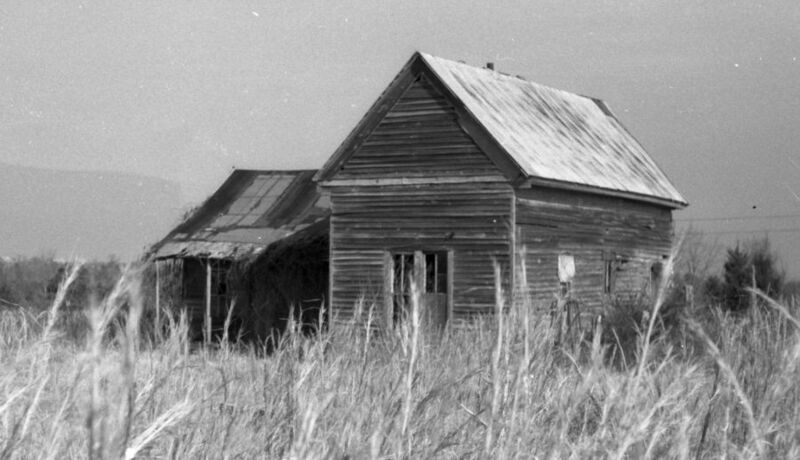 This old building was located at the corner on the south of the school property and across the road from the Fraziers. (I'll get the name of the owners later.) It had not been used as a hotel for many years, and it must have been torn down in the early 1950s. The 'stitching' of two photos to make one is a little rough, but it does give an idea of the overall look of the hotel. This photo of Cleveland was made after the 1956 cars were placed on the market and before I received a Kodak Brownie camera on my birthday in 1957. 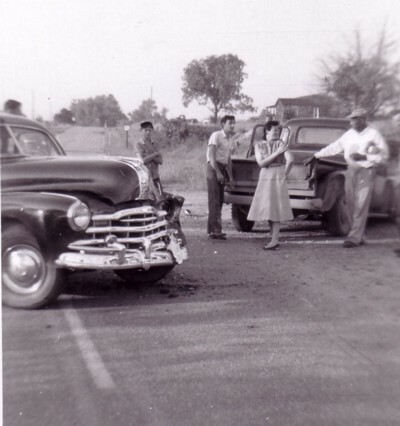 The 1956 Plymouth Belvedere, nearest to the camera, was probably the one owned by the O'Neals. Doyle O'Neal was postmaster and lived in that building in the early 50s. 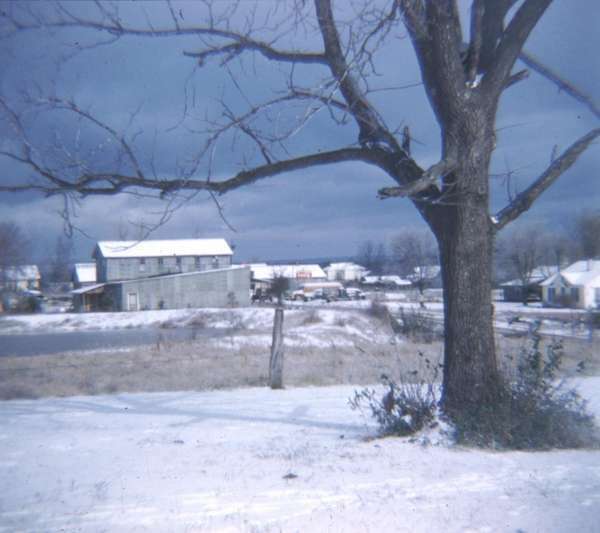 The next building on the left was the town auto garage. Both buildings have since been torn down. 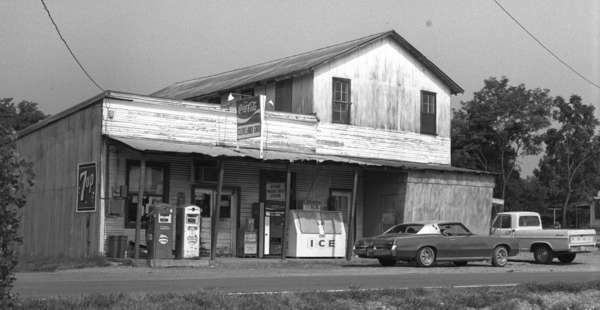 The building on the right had been Henry Frazier's merchantile store for many years. It was the one moved from the other side of the road early in the 20th century. Lyonell Halbrook, my stepfather, bought it and its contents some time after Mr. Frasier died. He first operated the post office there but then bought the Bost grocery story next door. The post office was in the Bost building for many years. 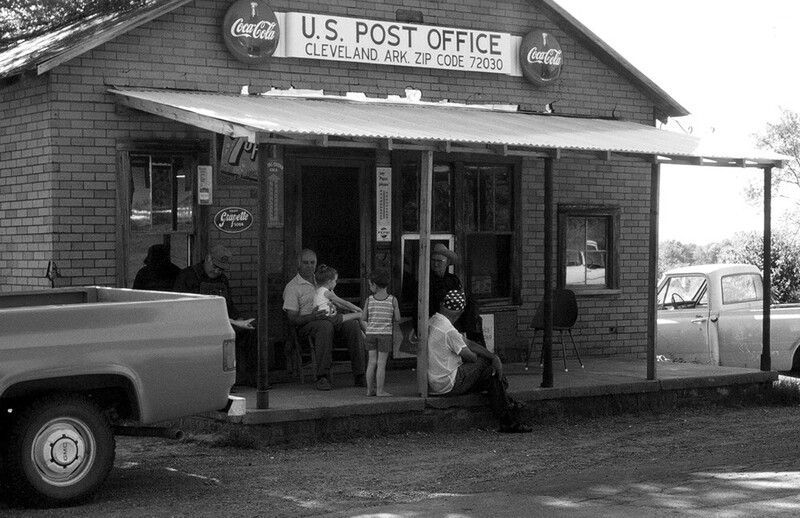 The Frazier store has been torn down and a modern building was built there to serve exclusively as the post office. The Bost store building is the only one of these remaining. It is closed and is used for family storage. Photo note - I was 15 or 16 years old at that time and I was experimenting with old cameras. I don't remember what I used for these photos, but it had a poor quality lens and the film path had something that scratched the film. I recently found and scanned these photos and realised that I had been trying to create a two-shot panorama. I used photo software to match, stitch, and touch-up this stitched digital panorama. 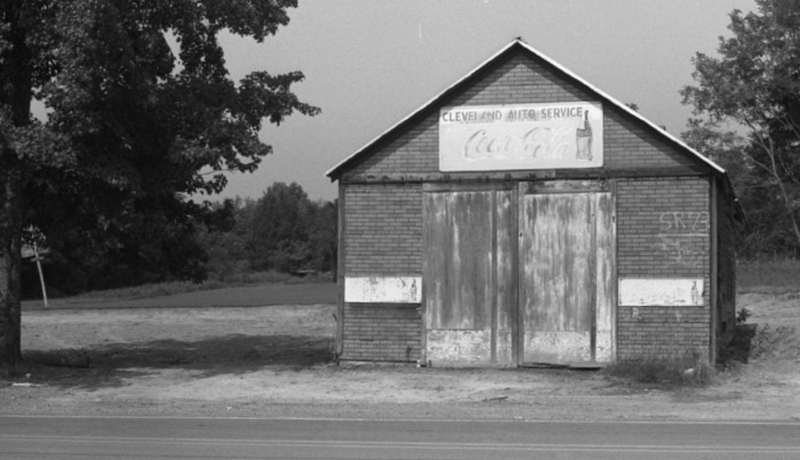 This photo of the Cleveland Auto Service was made long after it closed. 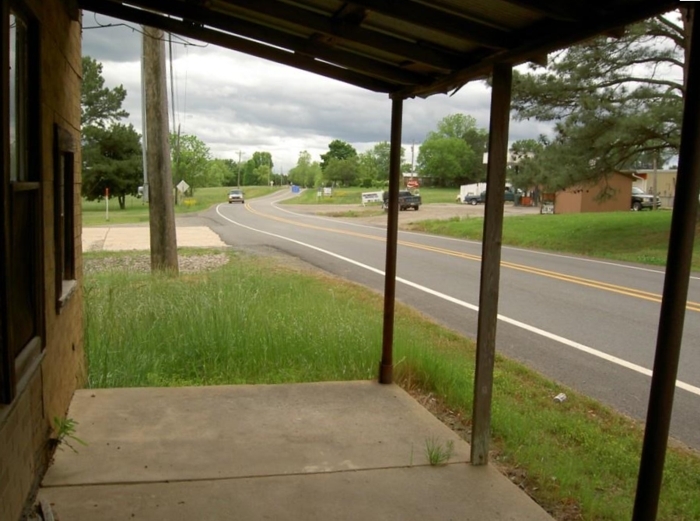 This is a more recent view from the porch of the Halbrook Grocery/Cleveland Post Office which used to be the Bost Grocery. I remember a garage adjouning the back of this building on the east. 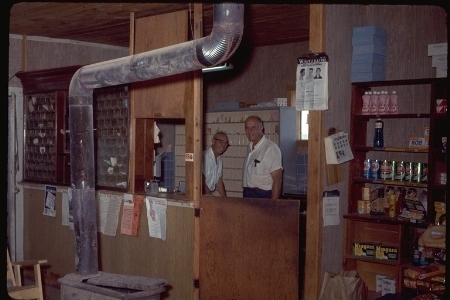 Lyonell Halbrook and Doyle O'Neal inside the Post Office section of the store about 1966. 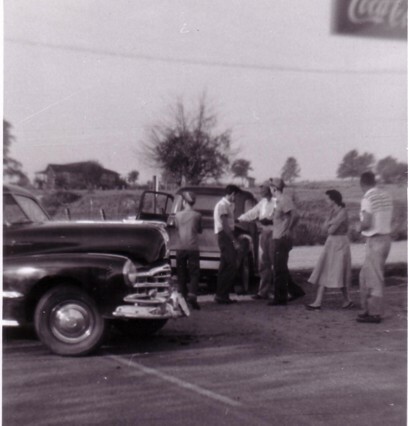 Gathered on the porch of Halbrook Grocery are Thomas Williams, Lyonell Halbrook with Becky Skipper in his lap, John Skipper in front of him, Byron Shewmake sitting on the edge of the porch, and Hi Bowling. 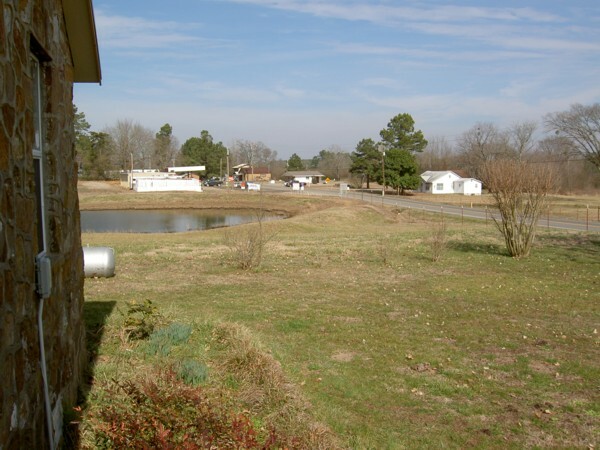 This is a three-photo digitally stitched panoramic photo of Cleveland, Arkansas, taken from our front yard. The second story of that old building was used by the Masonic Lodge. The one-story area was the grocery store and post office. The first floor of the two-story part was used as a private residence. We were back home for a short visit on November 15, 2009 and I took this set of panoramic shots just for comparison. Since the tree is no longer there to climb, I'll try to get a ladder or something to give me a higher perspective next time. Early in 1957 (probably in January) I climbed the big walnut tree in our front yard and took this photo of downtown Cleveland and the area off to the northeast. The car on the road is our 1956 Plymouth. 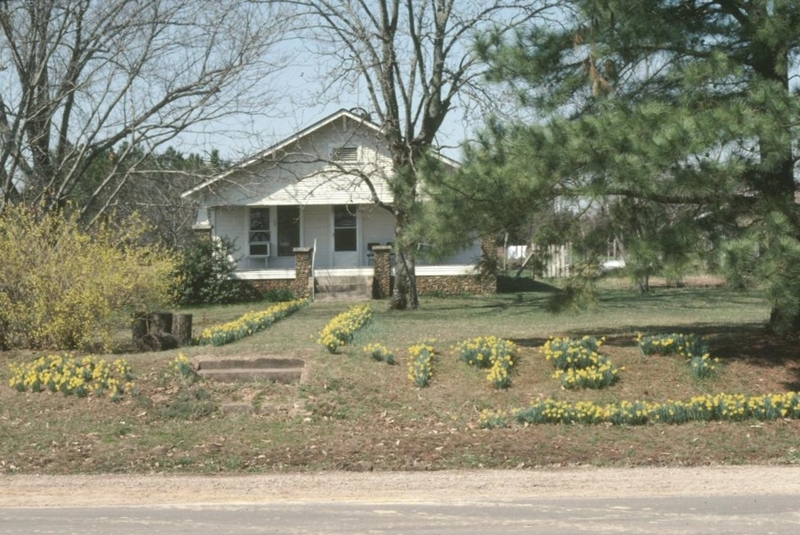 Miss Ludy's old house is visible behind Bill Reid's house. The tombstones in the Cleveland Cemetery show up well. The church building is hard to see. The school is clearly visible. Nearer to the camera is Miz Campbell's house. The Advent Church building is visible way off on the right. These photographic prints are date OCT 57. I usually didn't get the processing done for a month or so after the photos were taken, so this wreck probably occured in August or September. I don't know that I got any information about the vehicles, the persons involved, or the nature of the accident. I was only sixteen in 1957. The camera was some old thing I had found or someone had given me and it wasn't very good. Other than that, what can we say? The car is on State Highway 95, the main north/south highway in Conway County. It had been paved in the early 50's. 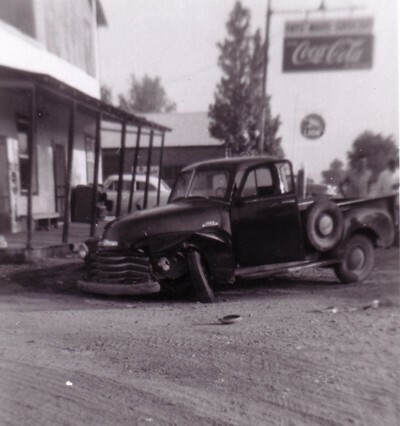 The pickup was pushed into the area in front of the 'old' store as shown in the first photo. The truck was partly on the dirt road leading west to the Methodist Church and the Halbrook's old home place. The road is stilled unpaved, but has been named Copelin Cave Road. The 'garage' was selling Lion gas back then. Our rock house is in the background over the second photo above the dam of the 'pond.' A woman is walking into the view. In the third photo the woman seems to be indicating an injury. Jerry Bowling, who was killed in a car wreck the year he graduated from high school, is looking directly at the camera. Our house is a little clearer in this photo, as is the old Dodge pickup in our front yard. 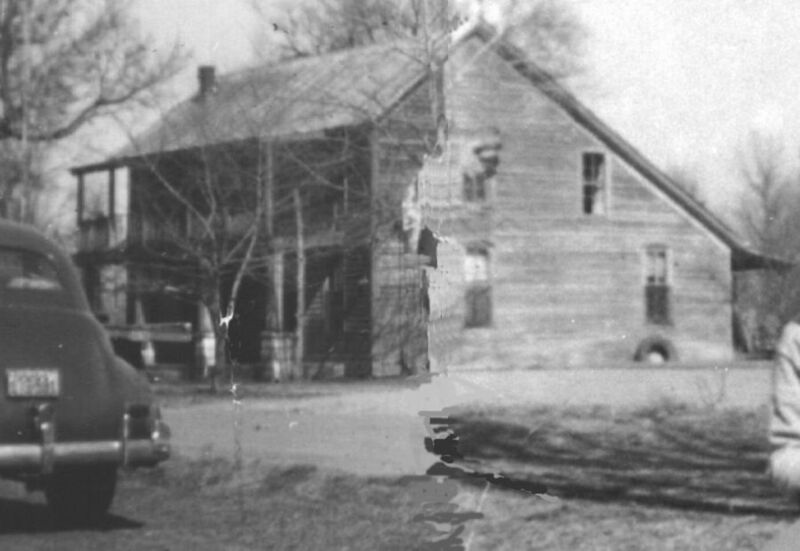 The fourth photo shows both the truck and the car in a view toward the Frazier store and the little house where Miss Mills (I think) lived. 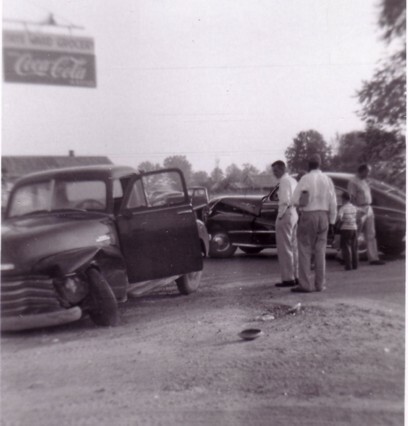 Also, Lyonell Halbrook, my stepdad, is walking past the back wheel of the car. A view of the back of the school house across our playground. 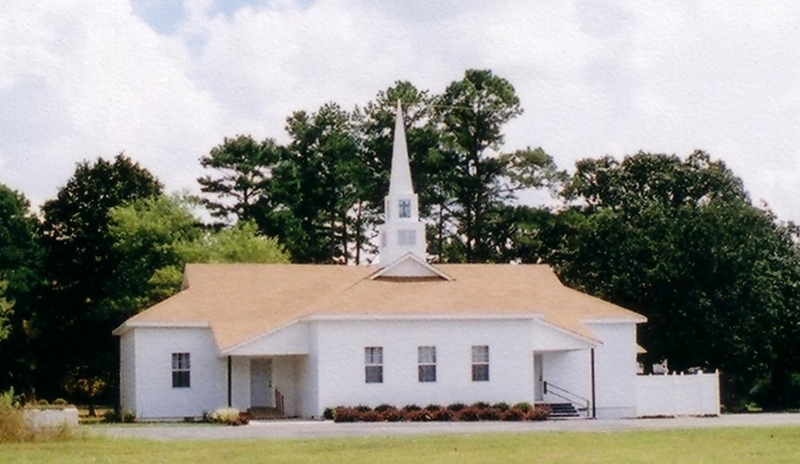 This may have been from 1960, years before the Baptist church bought the property and remodeled it to serve as their church house. The big tree beyond the corner of the building is the same one in the earlier photo of the previous building. 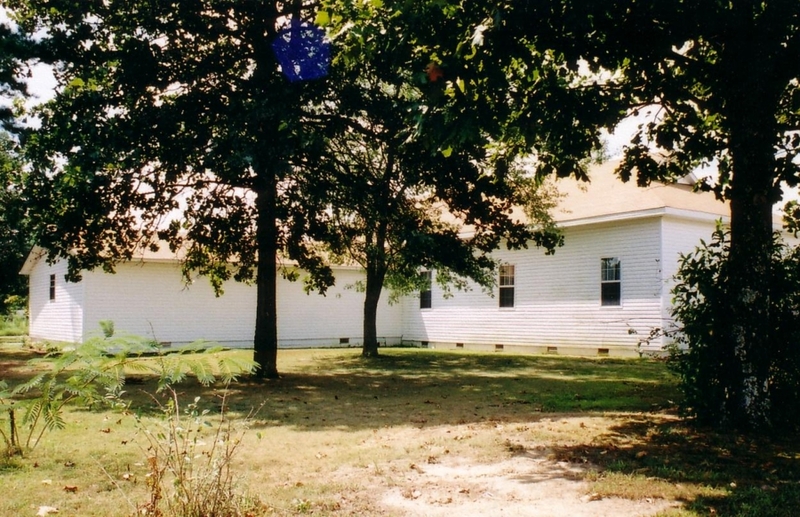 This view is from approximately the same location and shows the old school building after the Baptist Church coverted it into the church meeting house. This is the view of the front of the Baptist Church Building from Highway 95. This is the front of the old store not too long before it was torn down. 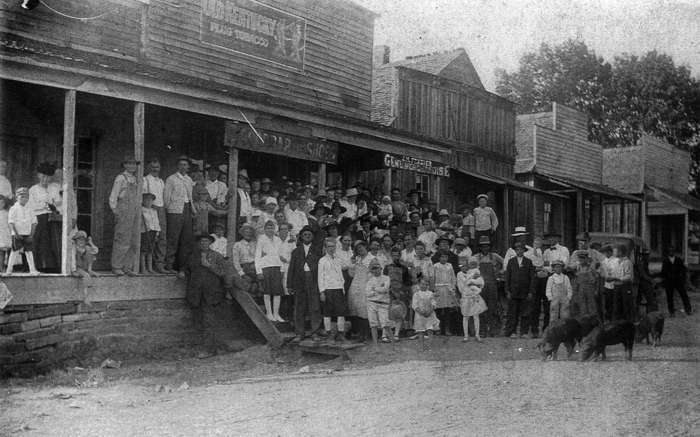 It sits on the corner that had been occupied by the first store in the old 1900s photograph above. This image is from a 35mm negative. This is the front of the new store. It is on the same property, but is set back from the corner to make room for parking. Parking had not been a major problem back in the first half of the 20th century. The smaller building has been removed and there is a fenced storage area in that location now. This image is from a 35mm negative. In the background on the left is the Bowling home with its unique architecture. The front of it is visible in the next photo (on the left). It is another of the old Cleveland landmark buildings. When I wanted to check out camera or film or finish a roll, I would step out in front of our yard and take a photo of town. I only vaguely realized that I was producing a before and after record of the changes in town. The house at the extreme left belongs to the Bowlings and has been in their family for many years. Almost invisible in the center in the clump of green trees is the tiny house where the Bowling boys were raised. It is dark unpainted wood and only the gable roof and part of the front is visible. The old 'landmark' store is next. (The back of the roof of the old auto garage is visible behind the store.) Frazier's store is across the street and the school building is visible in the distance behind it. By 2002 I was taking photos of town to document the changes. The changes do not occur rapidly in this little spot out in the country, but you never know. The new store is there and the fenced storage area. The new Post Office building is across the street. An indoor bathroom has been attached to the old house across the street on the right. Behing the "Citgo" gasoline sign, slightly to the left behind the bare tree, is the rusty tin roof of the old Bost store which Daddy used as his post office and grocery from 1958 to 1983. Then to the right of the sign in the distance is the old school building that now is used by the Baptist Church. It has been remodeled and makes a nice facility for them. Change came quickly that week; it snowed a couple of days after I took the previous photo. I took this photo from further out in our yard so the old Bost store is visible and the school building is still visible between the trees. I see that the bare tree is actually on the other side of the store. Going back in time to another snowy day in 1958 several of the old building are visible. The old store, Frazier's store (which actually is the oldest I suppose), school house, the little home on the right and a building to the left of that home which was used for a while as the post office. Then it was moved across the street behind and north of the garage and was the post office there for a while. The walnut tree in our yard was struck by lightning and killed not long after Momma died in 2000. The walnut tree is gone, the interior of our old home has been modernized, and the town has changed in the 48 years since we moved to Cleveland after Momma married Daddy and they built the rock house. This view covers a wider angle than most of the previous views, but the buildings are still recognizable. The new store is behind the fenced area, the Bost store (Halbrook Grocery and Post Office) is there with its rusty tin roof and its faux brick asphalt siding, the new post office complete with indoor plumbing (most residences not have indoor plumbing and are connected to a county water system), the school (now church) is hidden behing the little evergreen tree in the center of the photo (Is that a hint of the white steeple on the left edge of the tree? My old school friend and his brother had added the steeple since my previous visit), and there is the residence that has been there for more than 50 years. This photo was taken on one of my visits back home from school in 1960. It is on 35mm film and I think one of my friends at school processed it for me. I don't know whether that's his or my finger print on the right. Beginning at the right I think I see part of the old store. Next is a tree and below and left of the tree is the old Bowling home, the one they lived in while the boys were growing up. It's dark gray with a gabled roof. There is a barn next then behind the evergreen tree is the older Bowling home that is square with what I call a 'hip' roof (no gables). The large bare tree at about one fourth of the way from the right is the walnut tree in our front yard. Next is our rock house. In the center is the chimney of the old house Daddy owned across the highway from our house. It was on the forty acres he owned on that side of the road. Behind the 'shoulder' of the chimney is the 1949 Oldsmobile '98' that I bought in 1958. I drove it a year and a 'U'-joint broke and broke the end off the transmission shaft. I couldn't afford to fix it so there it sits. Up the hill in the back is Uncle Othell and Aunt Reva Dale's house. I helped haul gravel for the foundation when I was a teenager. Next is our old barn where I did chores for ten years. It fell down soon after this photo was taken. 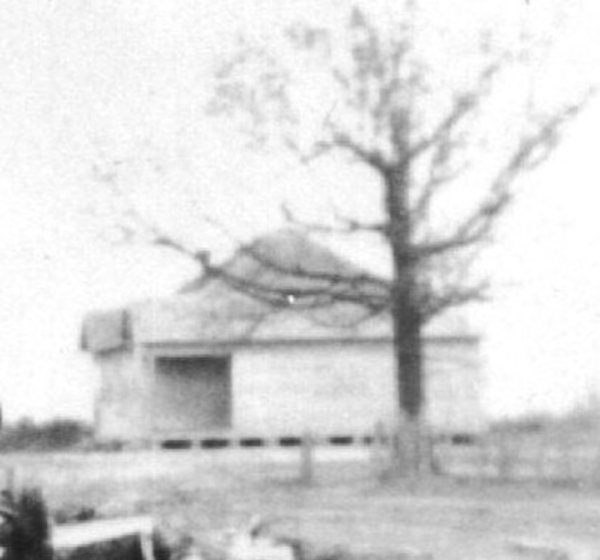 Further up the hill, which is the highest point in Cleveland, is one of Uncle Othell's barns. The steeple and part of the Methodist Church building is visible to the right of the barn. 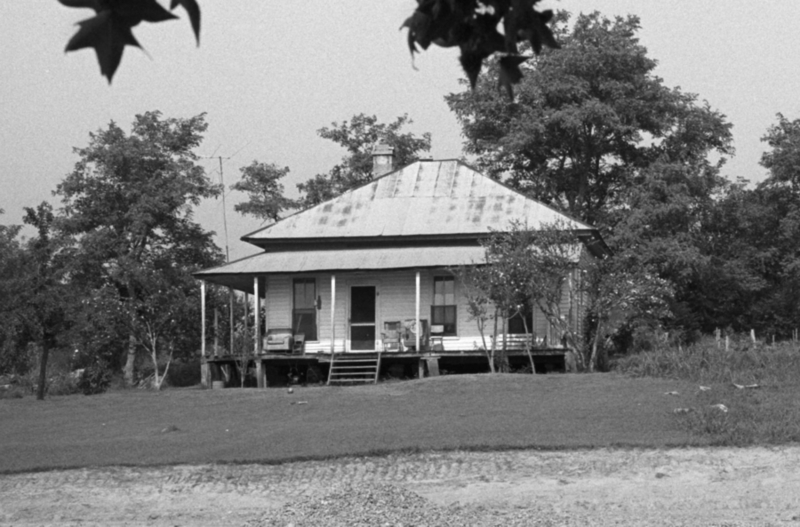 The old Halbrook home place is visible as a white triangle (the front roof gable) just to the left of the little evergreen just left of Uncle Othell's barn. I was standing near this old house when I took the previous photo. The house had been vacant for several years. At one time an old car body sat out in the field between it and the road that runs east from SH 95.